Astigmatism is a very common disorder and is easily corrected. Most of us have some degree of astigmatism. Astigmatism results in blurred vision at all distances. It is known as a refractive disorder of the eye. Refraction is the bending of light. When a light wave enters the eye, it is bent by the cornea as it makes its way through to land on the retina. The cornea, lens and retina contribute to clear vision at all distances. In astigmatism, vision is blurred due to either an irregularly shaped cornea or lens. Lenticular astigmatism is rarer and caused by an irregularly shaped lens. It is associated with diabetes as blood sugar levels can result in a change in the lens’ shape. Corneal astigmatism is much more common and caused by an irregularly shaped cornea. The cornea is normally symmetrical and round, but in astigmatism the cornea can become elongated like a football. This causes the light rays to split in the eye, never achieving a singular point of focus. Why some people are born with an elongated cornea is unknown. Some studies show that it could be hereditary. Astigmatism is prevalent in premature babies and babies born at a low body weight. Astigmatism can be caused by injury to the eye and subsequent scarring of the cornea. Some surgeries that can scar the cornea may also cause astigmatism. Keratoconus, a disease of the eye that causes a thinning of the cornea to occur, can cause astigmatism by changing the shape of the cornea. Astigmatism reveals itself early. While slight cases of astigmatism may not need to be corrected, large amounts of astigmatism can cause blurred vision, headaches and eye strain. People who have myopia, nearsightedness, or hyperopia, farsightedness, are likely to have some degree of astigmatism. Myopia, hyperopia and astigmatism are all known as refractive disorders as they affect the way that the eye is able to bend, or refract, light rays onto the retina. A complete eye exam will test for astigmatism. 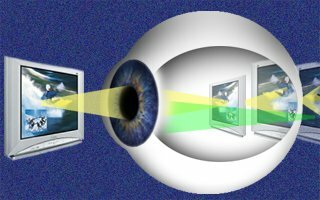 Retinoscopy or an automatic refraction test may be performed to detect astigmatism. 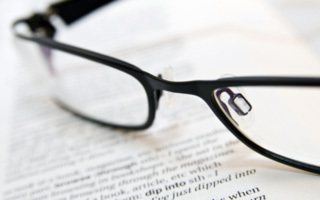 Treatment options for astigmatism include eyeglasses or contact lenses. Orthokeratology is another treatment that involves wearing special contact lenses that gradually reshape the cornea into its proper dimensions. • Laser eye surgery: A surgical procedure where vision is corrected by removing a small part of the eye with a laser. Using a highly focused laser beam, a specialist cuts away a bit of eye tissue, flattening the cornea and correcting the focus. • Astigmatic keratotomy: A surgical procedure where the cornea is reshaped by a surgeon. Tiny cuts are made in the cornea along the steepest curves, refocusing the light that enters the eye to its proper place. This surgery is replacing laser eye surgery as the preferred treatment for high levels of astigmatism. A diagnosis of astigmatism can be made during the course of a comprehensive eye exam. A phoropter allows the doctor to show a series of lenses to a patient, switching back and forth between them to determine the best fit for corrective lenses. A keratometer, a device to measure the curvature of the cornea, may be used as well. Corneal topography is a technologically advanced treatment where computer imaging is used to make a map of the cornea. This map provides the most complete view of the cornea and is used when diagnosing astigmatism, as well as being used to fit contacts to the eye and prepare patients for eye surgery. There is no known way to prevent astigmatism. Maintaining overall health as a means to eye health is always recommended. Fruits and vegetables high in vitamins A, C and E are key foods for eye health. Taking frequent breaks while doing close work allows the ocular muscles to unwind and can help ward off eye strain. Try looking off into the distance every ten minutes or so to keep your eyes relaxed. Wearing sunglasses to prevent UV damage to the eyes helps keep vision sharp later in life. If you are experiencing headaches, fatigue, eye strain or blurred vision, you may have astigmatism and should be examined by an optometrist or ophthalmologist.